Tugboat’s Vacation Scheduling Bundle fully automates the entire process of managing employee vacations. It builds on our Workforce Services Core Package and is ideal for a large workforce using multiple shifts. This comprehensive solution significantly reduces the workload for HR and front-line managers. As important, employee satisfaction gets a real boost since they are now empowered with self-service features that are fast, and available over the Internet. 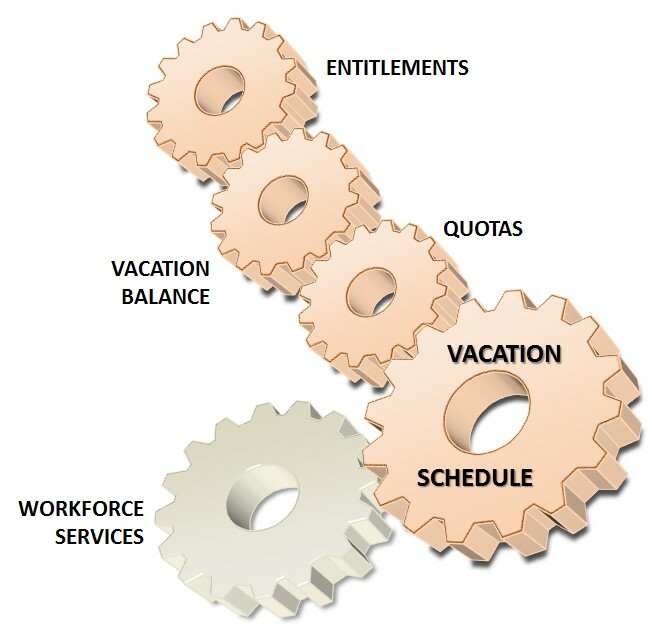 Beginning with employee data from Tugboat’s Workforce Services package, Entitlements are combined with employees’ vacation balance. Using quotas, employee requests are tested for the number of employees allowed off. Finally, this solution processes these requests automatically into approved vacations while consistently enforcing your policies and rules. For a brief view of the capabilities, watch the video. Request Processing – Vacations granted automatically in rounds with deadlines, by direct assignment, or on a first-come-firstserved basis. Balance tracking – Maintains each employees’ vacation balance; including carry-over from for the prior, to current, and upcoming year. Entitlements – Manages entitlements based on total years or months of service or based on anniversary hire date. Vacation processing – Manages deadlines and automatically processes vacation requests for weeks, blocks of days, days and half days. Quota enforcement – Manages and enforces quotas for the maximum number of employees allowed off, for multiple designations including mixed quotas. Coverage – Includes FMLA, absences and disability leave, including credits as your policies require. Employee self-service – Enables employees to submit, cancel, and suspend requests, check for available vacation periods, and retrieve reports. Suspend – Enables employee to suspend a granted vacation while they bid on an alternative vacation period. Internet Access – Provides Internet access for all employee functions including reports. Fast – Provides immediate employee response to first-come-first-served requests with Instant Grant.